Embracing the ancient Chinese tradition of healing, Aculife uses the time-honoured philosophy of Wu Sing, or “five elements” as the basis of its treatment. 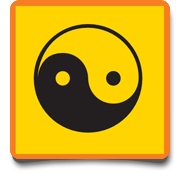 The five elemental energies – earth, gold, water, wood and fire – symbolise the life forces present in all living things, each one being a manifestation of Yin and Yang, or the opposing states of nature. 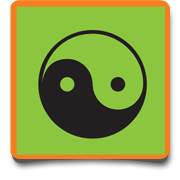 Representing the state of optimum balance, earth regulates the five elements. 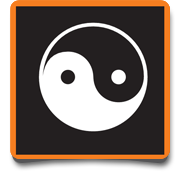 As the pivot of the cycle, it symbolises late summer when the Yang energies of spring and summer transform into the Yin energies of autumn and winter. Representing the state of purification, gold is linked with autumn when energies are purified and conserved for the impending winter. Gold symbolises wealth and prosperity and is characterised by radiance. Associated with winter and extreme Yin, water is represented by the colour black. Characterised by the season of rest and stillness, the water element is meditative and gentle. 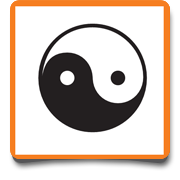 In feng shui it is widely used to promote wealth and good luck. Expressed is the season of spring, where new life begins and hibernation ends, wood is the start of Yang energy. Characterised by growth and renewal, wood is represented by the colour green. The strongest Yang energy in the five elements, fire is associated with vitality and the heat of summer. It is the most energetic of the elements and is used to counter excessive heat. It is represented by the colour red. 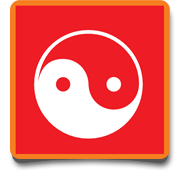 When attempting to heal your body using Chinese medicine, you are effectively using the principle of Yin and Yang to balance your body’s cells so that positive and negative elements are equalised. There are 12 meridians in your body which link the various organs and tissue together, 3 starting in each hand and three starting in each foot. Acupoints are junctions along the meridians which store energy (chi) as it travels around the body. Stimulating the Acupoints, whether with needles or electro-magnetic pulses, increases the flow of chi in your blood and therefore the body functions better. Acupoints reflect the efficacy of internal systems in the body and so Aculife can diagnose the body’s health by reading the flow of energy through the Acupoints. 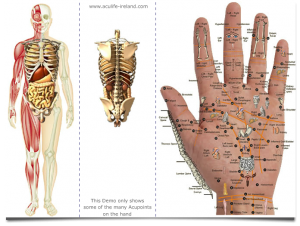 Because all of the organs and tissues are connected by meridians, it is possible to check the Acupoints in the hand to determine the health and effectiveness of any part of the body through the hand.